To our knowledge, this 775-page volume is the most comprehensive course on this topic in print. It contains information that has not appeared in any other book defending the King James Bible and breaks new ground in several areas -- such as the importance of the ancient separatist versions in the defense of 1 John 5:7, an exposition of the doctrine of Bible preservation from 43 passages of Scripture, documentation of the corruption of evangelical scholarship over the past 50 years and of the apostasy that enveloped the 19th century as modern textual criticism was devised and that further enveloped the 20th century as modern textual criticism became entrenched, and documentation of the role played by Unitarians in the development of modern textual criticism, to name a few. 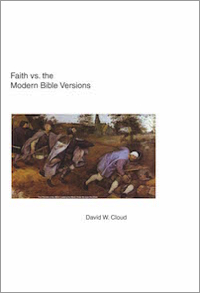 If you are new to the Bible Version issue and want to understand it, we believe this is the book for you; and if you have already been studying this subject for some time, you will find a wealth of new things here. The course features 783 sectional review questions to reinforce the teaching. Book: Softcover, 775 pages, 7 x 8.5 in.